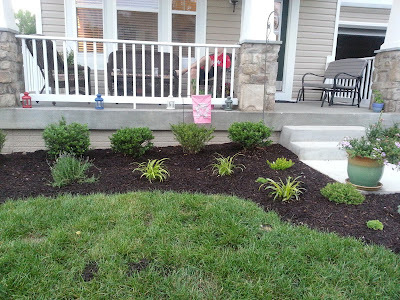 The builder did a decent job of landscaping the front of our house before we moved it. I liked the shape of the flower beds along with the big magnolia bush at the end of the front porch. I liked the boxwoods too. 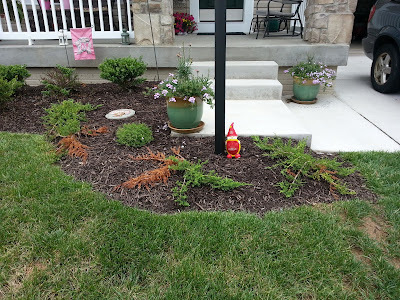 However, I did NOT like the junipers or the thorny red bushes (not sure what they are called) that they planted. 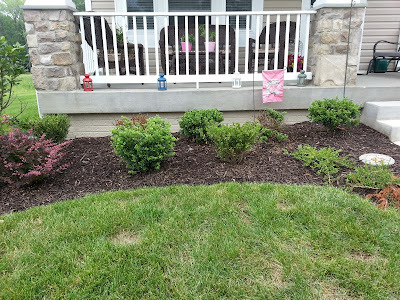 My goal from day one was to get those junipers out since I hated them at the old house and to dispose of the red ones. The red ones are pretty color-wise but are THORNY and, according to my sister, an invasive species. And then last Friday, it rained, and rained, and rained. (Such a rainy spring!) And I remembered seeing such pretty flowers at Home Depot the week before and deciding THIS was the time to do it. The ground would be soft and make getting the plants out easy. I was delighted with what I found at HD because my hope was to only plant perennials if possible. I got so many different things and was so excited to go home and tackle it. Well, I certainly picked the right time to do it. All of the plants came right out of the ground with only a little pulling. The kids helped me too and enjoyed knocking the dirt off the roots of the old plants. I am very happy with the results and I'm looking forward to seeing how it will look when everything fills in. 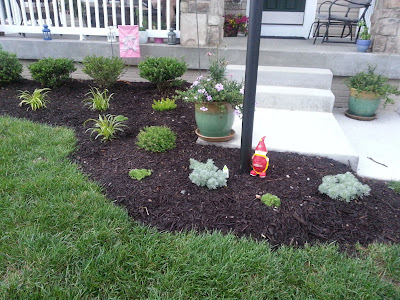 I replaced the junipers with a couple of succulents (one is called "hens and chicks" and I can't remember the other one) and something called "wormwood." 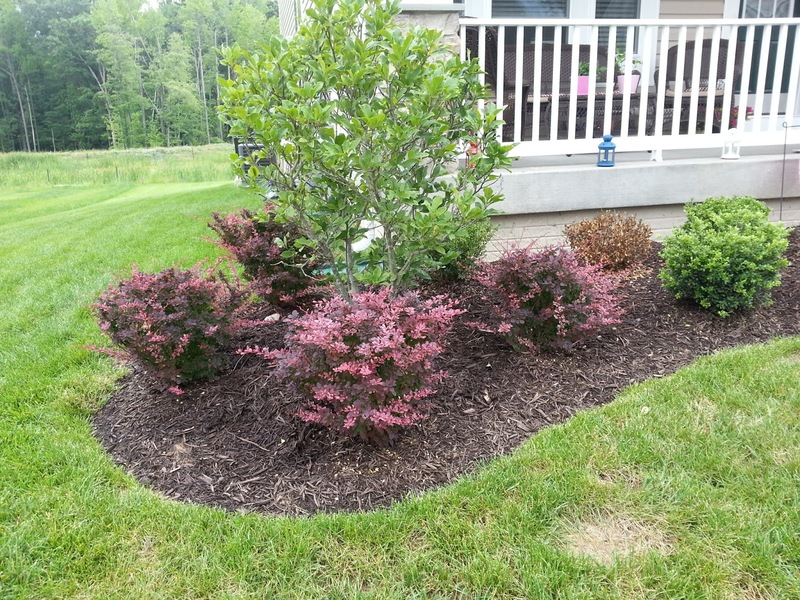 Next, I pulled the dead boxwoods out in the back row and replaced them with the two in the front row. 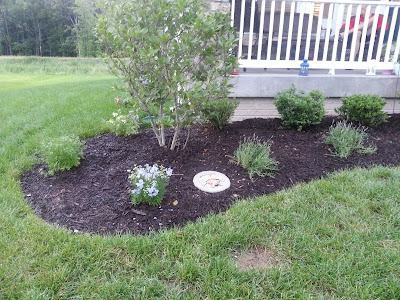 Then in the front, I put in lariope and lavender.....I LOVE lavender! junipers! Argh! Those are what we have and they have grown and grown and now they are gigantic! Gotta get rid of them. I do like boxwoods too, but i don't have a green thumb. I tried to dig up a dead plant last week and when I pulled out the dead roots, about a zillion ants appeared from underground and I got scared and ran screaming. 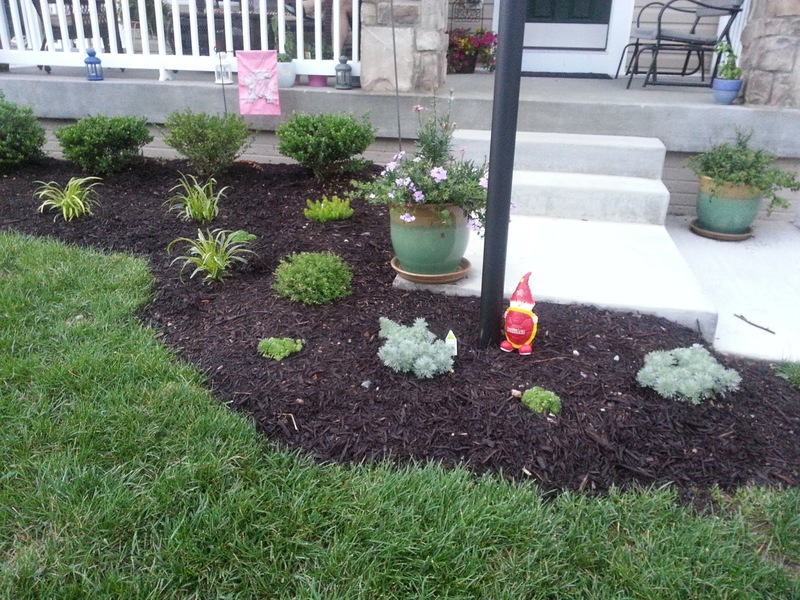 I will never touch the mulch again. Help!!! Yours looks great. You and your sister have the green thumbs!! !